Germany combines historical and cultural treasures in picturesque towns of cobblestone streets and half-timbered houses with spectacular landscapes of imposing fairytale castles, snow-capped Alps, the meandering Romantic Road and the legendary Black Forest. The beautiful Bavarian cities of Munich, Nuremberg and the dreamy Rothenburg captivate visitors with their rich history, labyrinthine old quarters, medieval market squares and striking cathedrals. In December, they are transformed into a truly unique Christmas wonderland which cannot be duplicated anywhere else. This is where you can really escape the excessive commercialism of the holidays and experience a more authentic and intimate version of Christmas. Germany is the birthplace of most Christmas traditions, and the Advent season brings with it all of the traditional Christmas festivities, along with the Christmas markets that spring up in squares and streets of German towns. We'll hum along to the sound of carillon in Munich's Marienplatz and to traditional Christmas carols sung by children choirs, played by brass bands and Alpine blowhorns. We'll shop for culinary and cultural treasures beneath a sky of twinkling fairy lights, talk to friendly artisans, breathe in the aroma of roasted chestnuts, gingerbread, cinnamon, almonds and freshly cut pine. We'll enjoy Bavarian roast duck Christmas dinner, delicious mulled wine, baked apples and Christmas pastries. We'll collect hand-made, quality gifts and ornaments in the charming markets of Munich, Nuremberg, Dinkelsbuehl and Rothenburg, as we enjoy the Christmas tradition at its very finest. 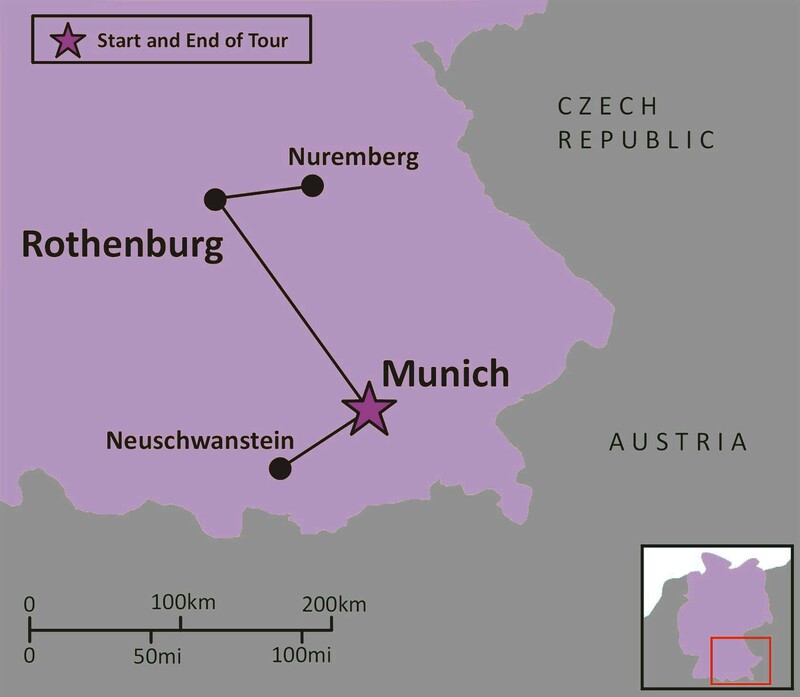 During the Christmas Markets tour, we'll experience the best of the German region of Bavaria. We'll marvel at towns sparkling with lights and perfect little villages, we'll meet friendly locals, share wonderful meals and enjoy live performances of traditional Christmas music. 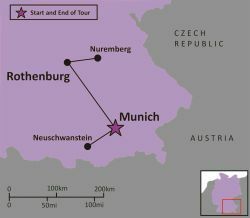 We'll visit the Residenz Palace, the English Garden and see the sky-reaching Gothic cathedrals of Munich, the medieval Old Town and the Christmas Museum in Rothenburg, Albrecht Durer's House and the Craftsmen's Courtyard in Nuremberg, and the improbable castles of Hohenschwangau and Neuschwanstein. Throughout the tour, we'll dine a la carte at carefully selected fine restaurants and authentic beer halls. Additional/optional costs may include: optional single supplement, optional travel insurance, optional tour director's gratuity, meals not included in the itinerary, room service, minibar, laundry, phone calls, and personal expenses. I enjoyed this tour very much. It really put me into the Christmas spirit and opened a new world of Christmas shopping to me. - Margaret from Washington, D.C.